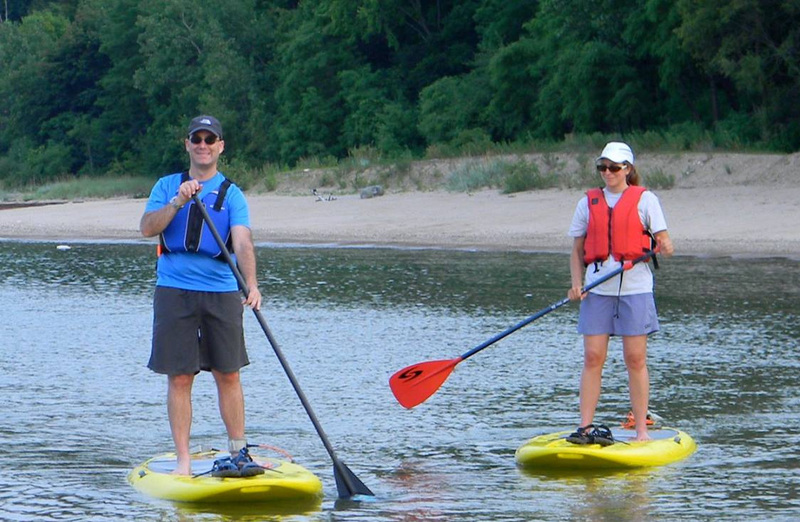 The NSYC owns a variety of Stand Up Paddleboards (SUPs) exclusively for member use on Lake Michigan. Our fleet includes all around and flatwater boards that can accommodate small to large-sized adult paddlers. SUP use is available for members on a first come, first served basis. Members are required to use the safe boating “buddy system” where no one ever paddles alone and two boards paddle together at all times. A secure, US Coast Guard-approved Type III Life Jacket (Personal Flotation Device) is required to be worn at all times. Minors 17 years and younger are required to paddle with an adult member 18 years or older. See our Membership page for annual membership rates and full club benefits. SUP beachfront storage rental is available for residents and non-residents by contacting the Park District of Highland Park directly. All members wanting to use club paddleboards must pass a SUP Skills and Water Safety Assessment. Once you have passed the assessment you will receive access to the boards. Alternatively, members who have successfully completed the club’s Intro to Kayaking course or the SUP Basic Skills Class may use the paddleboards and will only need an equipment lesson. Assessments are free of charge and scheduled at the beginning of the season. Pre-registration is required and dates can be found on the NSYC calendar under Events. Late season assessments are by appointment. Use the REGISTER NOW link to sign up. The NSYC offers several paddleboard classes and events for beginners to intermediate paddlers. Each class is taught by an ACA certified paddleboard instructor. Board, paddle and life jacket (PFD) are included. Pre-registration is required for each participant as boards and space is limited. Classes are available to adult members, as well as those ages 13-18 years old, when taken with an adult member. *These Classes and Events require pre-registration unless specifically marked; boards are available on a first come, first served basis. Registering for a Class or Event begins by clicking REGISTER NOW and logging into our Membership site. An introduction class to Stand Up Paddleboarding (SUPs) taught by our ACA SUP instructor. You will learn about water safety, paddle strokes, basic board balance and control, equipment, board sizing and board types. The remainder of the class will be spent paddling Lake Michigan. Participants that successfully complete this class will be qualified to use club Paddleboards. Aimed at beginners, this class is on land only and you will learn about basic paddle strokes and balance work. Participants use an Indoboard to simulate the movement of a paddleboard on water that will improve endurance and develop your balance skills. All NSYC members wanting to use club Paddleboards must complete our SUP Skills and Water Safety Assessment prior to using club Paddleboards. Participants will be required to swim 25 yards with and without a life jacket, perform simple paddle skills, fall, recover, and remount the paddleboard. Come paddle on Thursdays  boards are available first come first served. Join other member paddlers for a casual evening on the lake, a great time to meet other buddy paddlers and try out our boards! Optional  bring snacks or food to share on the deck afterwards.